Aflatoxin is a hidden burden. It is spread by a deadly pathogen affecting five billion people across the world, but rarely making headlines. It is not carried by birds or mosquitoes, but hidden in staple foods like maize and groundnut. Common moulds, Aspergillus fungi growing naturally on food crops, can produce poisons called aflatoxins, which have serious effects on health, suppressing immune systems, hindering child growth and even causing liver cancer. Taming this fungal threat with a biotechnological double-defence line offers hope to controlling this toxin. Using innovative biotechnology approaches, researchers have developed groundnuts free from aflatoxins thanks to a double-defence line. By producing small proteins called defensins, these groundnuts can stop the deadly fungus from propagating and infecting. At the same time, the groundnut seeds also emit gene-silencing RNA molecules to help shut down the synthesis of aflatoxin by the fungus. When exposed to the aflatoxin-producing moulds Aspergillus flavus and A. parasiticus over three days, the double defence groundnut seeds remain untouched, unlike the green and mouldy petri plates of other tested groundnut varieties. This breakthrough research from the International Crops Research Institute for the Semi-Arid Tropics (ICRISAT), part of the CGIAR, and their US partners (US Department of Agriculture, Louisiana State University and Donald Danforth Plant Science Center) has just been published in Plant Biotechnology Journal (doi.org/10.1111/pbi.12846). In the coming years, this could lead to significant reduction of aflatoxin contamination in farmers’ fields. This revolutionary approach applies not only to groundnut but also for other important crops like maize, cotton seed, chilli, almond, pistachio etc. This will radically improve food safety and security especially in Africa and Asia, and avoid thousands of tons of fungi-affected crops being discarded every year or being consumed with unacceptable levels of the toxin. Aflatoxin is a very acute public health issue, with five billion people exposed to this toxin across the world. The toxin-producing moulds thrive in poor soils, droughts and damp storage conditions, which means many communities in the drylands are at high risk. When food contaminated by aflatoxins is ingested in large quantities, it can lead to deadly poisoning with dramatic cases reported in the last 50 years, affecting both humans and livestock. For instance, in Kenya in 2004, a drought year, more than one hundred people died after consuming toxic homegrown maize. The exact annual death toll due to aflatoxins is however largely underestimated as they have a more insidious long-term impact on health and nutrition. Small amounts ingested daily cause chronic poisoning. 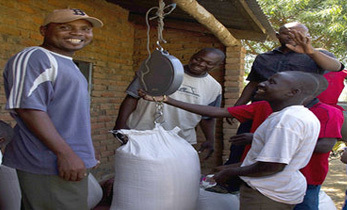 Aflatoxin reduces immunity and stunts child growth. High levels of aflatoxin ingestion could lead to numerous cancers, including the deadly liver cirrhosis which is on the rise and kills over 600,000 people every year. Public health experts say that one liver cancer out of four could be due to aflatoxin exposure. A WHO study on estimated disability adjusted life year (DALY) losses from major foodborne illnesses put aflatoxin as top threat, with a societal cost six times higher than peanut allergy [food allergies in the US cost over $20 billion a year]. Developed markets like the USA or Europe have set up stringent food safety norms. In USA, food containing more than 20 parts per billion (ppb) of aflatoxin cannot be sold or exported. For the EU market, it is ten times lesser (2 ppb). This has had tremendous impact on trade, with traditional groundnut-exporting countries like Senegal or Malawi being shut out, resulting in millions of smallholder farmers losing their livelihoods. 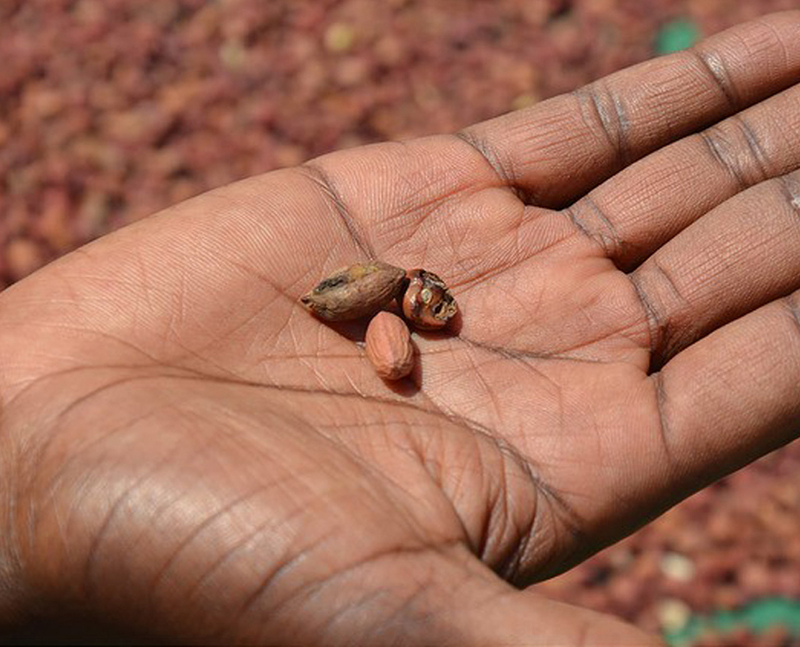 Unfortunately, peanuts rejected for export find their way into the less-regulated local markets in Africa and Asia, exposing local populations to acute contamination. A recent study, conducted over three years, on aflatoxin levels in peanut butter sold in Zambia, found that 50-80% brands were highly contaminated, way over the US limit, reaching up to 10,740 µg/kg. Aflatoxin is a very serious concern in India too. 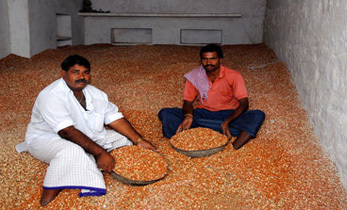 An ICRISAT study recently revealed that in southern India, aﬂatoxin levels in peanuts may be 40 times higher than allowed by Indian food safety limits. The Central Food Technology Research Institute, Mysore, also found that all samples of UHT packaged milk tested were contaminated with aflatoxin, with 38% having levels above the food safety limit. This shows that the poison finds its way through the food chain, for instance, if dairy cattle are fed with contaminated feed. 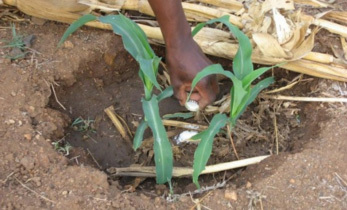 The fungi Aspergillus flavus and A. parasiticus, can stay dormant in the soil for years and infect many important food crops in the fields, such as maize and groundnuts, especially during drought and heat stresses and insect damage. Contamination also happens post-harvest when the grain is stored in unsuitable conditions (hot, humid and not well aired) that encourage fungi to produce the toxin. Farmers and scientists have tried to reduce aflatoxins in many ways, trying to develop aflatoxin-resistant varieties, improve quality control and post-harvest handling or biocontrol applications with harmless Aspergillus strains to compete with toxic ones in the soil. 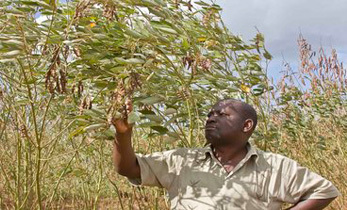 But these strategies have had very limited success in poor countries, especially for groundnut. 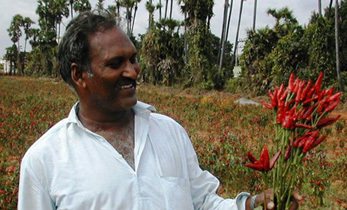 ICRISAT researchers suggest that ideally, the fungal infection should be halted right at the field. To boost the groundnut’s immunity against the fungus, researchers developed peanut lines able to produce small peptides known as defensins, that are often produced as immune responses to pathogens by some plants (but not usually groundnut), animals and humans (our eyes produce such immunity molecules). Working together with Dr. Dilip Shah from Donald Danforth Plant Science Center, defensin genes from alfalfa (a protein-rich fodder legume) and the Mediterranean clover were transferred into the DNA of an Aspergillus-susceptible peanut variety (named JL24) widely grown in India and Africa. These new groundnut lines could then have a robust innate immune response against different strains of Aspergillus flavus. The second approach, called Host-Induced Gene Silencing or HIGS, uses a naturally occurring biological mechanism where plants and pathogens often exchange small nucleic acid molecules, RNAi, during the infection process. It is somewhat like a vaccine where we inject bits of the pathogen in our body to later initiate a strong immune response. In collaboration with researchers from the USDA’s Food and Feed Safety Research Unit and Louisiana State University, ICRISAT researchers were able to transfer into the groundnut, specific small RNA molecules from Aspergillus fungus that are involved in the aflatoxin biosynthetic pathway, so that the groundnut seeds produce these RNA molecules during fungus attacks. This would inactivate the target genes in the fungus that are responsible for aflatoxin synthesis. Both approaches show great heritability (tested for over three generations) and remarkable levels of aflatoxin resistance. 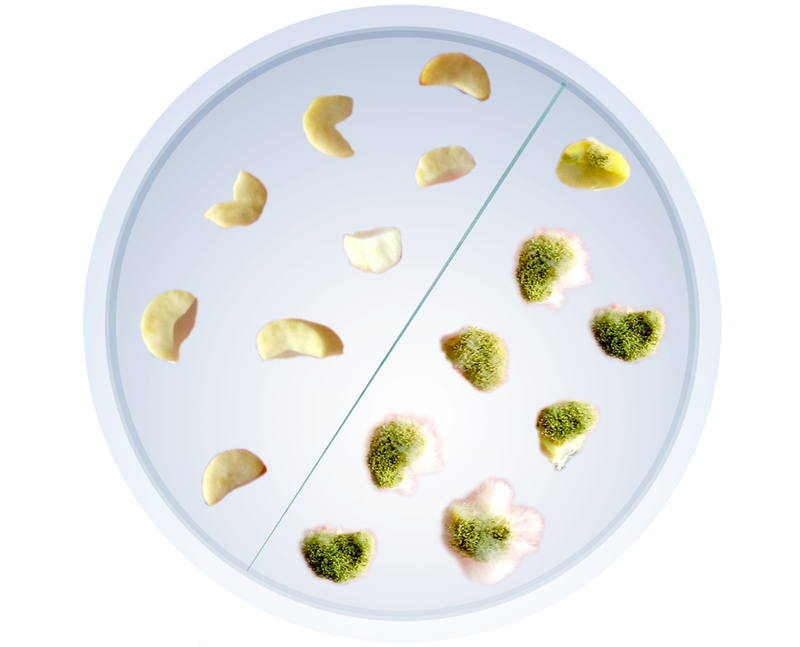 Using a highly sensitive detection tool (High-Performance Liquid Chromatography), researchers could detect hardly any trace of aflatoxin (below 1 ppb) after three days of fungus inoculation, compared to the control seeds that accumulated over 3000 ppb. This study shows that groundnut lines infected with the fungus, in conditions well above the field reality, were able to suppress toxin levels to below detectable limits. 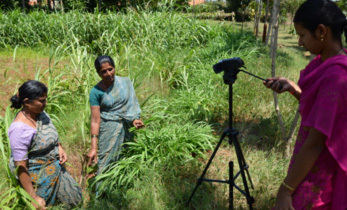 In a near future, ICRISAT researchers plan some extensive field tests with partners from Asian and African breeding programmes to cross these very promising aflatoxin-resistant lines and validate their agronomic performance according to biosafety regulations. The innovative research demonstrates a very tangible proof of concept to incorporate high aflatoxin resistance within groundnut breeding programmes. Further study of these aflatoxin-free lines will also help better understand the molecular mechanisms involved, which can be transferred to other crops. This creates a clear roadmap to tame these very harmful food contaminants at their source.